Dutch students of student society Unitas S.R. 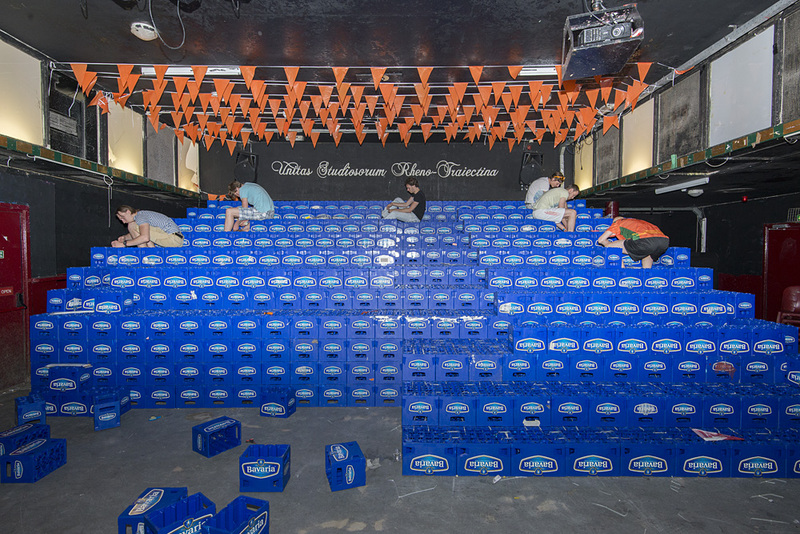 of Utrecht build a bleacher out of beer crates prior to the 2014 World Cup in Brasil. Ed Wisman, caretaker at the Mediacollege Amsterdam, tries to attach a orange flag to a lamp post. Two women are preparing for the game of the Netherlands versus Spain during the World Cup Football 2014. Children look amazed at a decorated house with a huge orange lion dominating the roof. A croud jubilates ecstatically as Holland scores a goal against Spain during the World Cup Football 2014. Crowds gather on the Streets after Holland won over Spain during the World Cup Football 2014. A garage decorated an old Audi in orange and red white blue, the colors of the Dutch national flag. Two women cheer when Holland score a goal against Spain during the World Cup Football 2014. Two young men celebrate on a scooter after Holland wins the football game over Spain with 5-1 during the World Cup 2014. For daily newspaper Metro Netherlands I registrated 'Orange Fever' (or Oranjekoorts in Dutch) during the World Cup football 2014 in Brasil. Dutch people tend to go totally crazy during football championships and dress themselves, their houses and their streets in orange. And every game the Dutch win, the fever temperature rises!